2011 Trius Winery (at Hillebrand) Rose’ | Wine Splash! Here is a fresh, fruity, yet dry Rose’ from a winery who excels in producing great wines. This is a blend of 56% Syrah, 31% Merlot, and 13% Cabernet Franc with all grapes being grown in the Niagara-On-The-Lake region of Canada. Fresh, refreshing, and delightful on the palate, this is a Rose’ that shows off its colors and flavor with food or by itself. In my glass, this Rose’ is a deep crimson red in color with a hint of orange on the edges. The nose teases you with notes of melon, strawberry, citrus, and spicy cherry. Medium bodied across the palate with a nice balance of fruit and acidity. Lush flavors of red berries, honeydew, raspberry, and cherry! On my second sip, more fruit flavors emerged like cranberry, citrus, and just a hint of pepper spice from the Cabernet Franc.Fresh with fruit sweetness but finishing dry. This wonderful Rose’ would pair well with a nice pork tenderloin, grilled shrimp with fruit salsa, salmon, pizza, or a summer salad with mandarin oranges. We have had many Rose’s from France, California, and other regions of the world but this is one of our favorites! 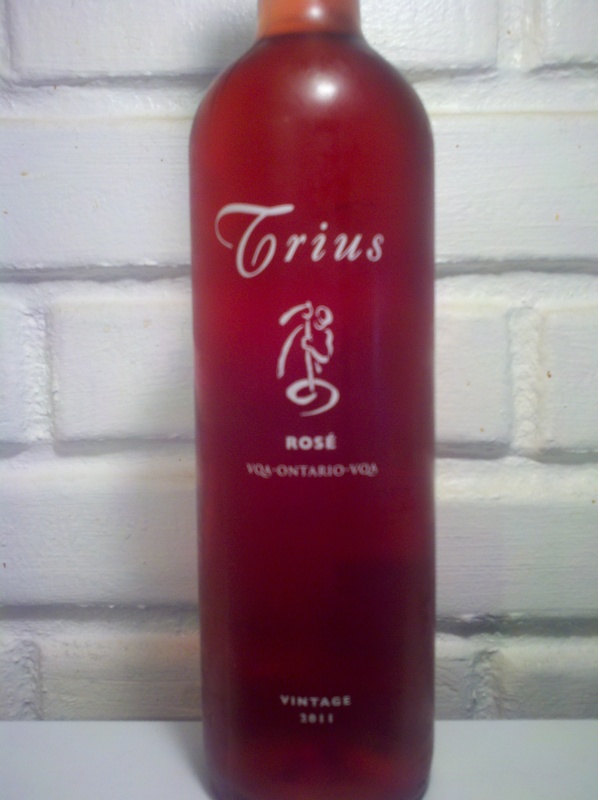 We give this 2011 Trius Winery Rose’ a 95 point score for its fruit, perfection, and balance. We definitely recommend to try this Rose’ when in Niagara-On-The-Lake and it is worth the trip since Trius is one of the prettiest and most charming wineries around! If you can’t make the trip, then go to the Trius Winery website to order a bottle online at WWW.TriusWines.com If you love a dry Rose’ with bright, fresh fruit bursting from your glass, then this will be a favorite of yours too! If you have a 2011 vintage of this wine, we recommend to drink and enjoy it soon and often! But it will last in your cellar through 2014. WineSplashing! !